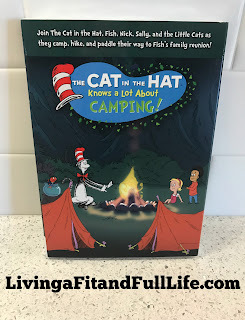 Living a Fit and Full Life: The Cat in the Hat Knows a Lot About Camping from NCircle + Giveaway! The Cat in the Hat Knows a Lot About Camping from NCircle + Giveaway! "It s the first day of Summer Vacation and The Cat in the Hat whisks Nick, Sally and Fish off on the greatest great outdoor camping adventure ever! Our gang gets back to nature as they hike through the Fickle Fern Forest, camp out overnight, trek over Mt. Weewobble and canoe down the Tickle Drop River....just in time for Fish to meet up with his family for a grand reunion. Along for the ride are Little Cats A, B and C, who discover there s wonder in nature once their electronic devices are powered off! Nick and Sally help keep the Little Cats out of trouble, while Fish tries to keep his jacket pressed and the mud out of his fancy fishbowl...all while getting up close to some of nature s most awesome sights, and learning how best to respect them. After being lulled to sleep under the stars by a chorus of animals, the morning brings fresh adventure with a spectacular race up Mt. Weewobble, complete with a cliffhanger ending! It s a slippery ride down the slope and into the Tickle Drop River, where a harrowing raft ride finally delivers them to the shores of Fish s family reunion. The Cat in the Hat and his loveable Little Cat cousins, Nick, Sally, Fish and all his family, gather together in a great Suessian-style musical finale... in which Fish and the gang are celebrated as true adventurers. Everyone agrees it really has been the Greatest Great Outdoors Adventure ever!" The Cat in the Hat Knows a Lot About Camping from NCircle is an absolute blast. The Cat in the Hat is a favorite in our house that every single one of my 4 kids enjoys. From my 2 year old to my 9 year old, they love that crazy fun Cat. The Cat in the Hat Knows a Lot About Camping from NCircle is filled with camping fun which is just perfect for this time of year as we gear up for our first summer camping trip. It's the perfect way to get kids excited about camping and being outdoors. I love that it encourages kids to put away their electronics and enjoy the good old outdoors. 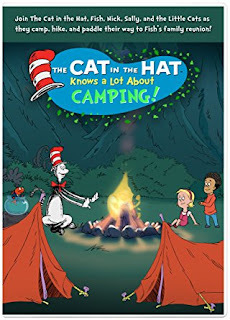 The Cat in the Hat Knows a Lot About Camping from NCircle is the perfect way to get kids excited about camping and my family and I highly recommend it!